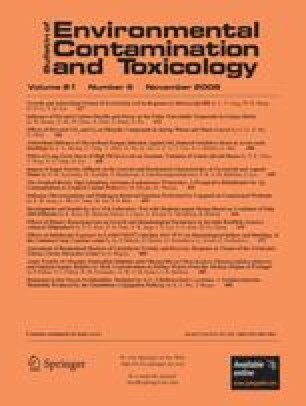 Effects of Subchronic Exposure to LASSO MTX® (Alachlor 42% W/V) on Hematological Indices and Histology of the Common Carp, Cyprinus carpio L.
The aim of the study was to evaluate subchronic toxic effects of the preparation LASSO MTX (alachlor 42% W/V) on hematological indices and histology of the common carp (Cyprinus carpio L.). In carp exposed for 28 days to LASSO MTX in the concentration of 2,400 μg L−1, significant differences (p < 0.05), were detected in all indices of the erythrocyte profiles tested except hematocrit (PCV) when compared to controls. At a lower exposure (240 μg L−1) concentration of blood hemoglobin and mean corpuscular hemoglobin were significantly reduced. In contrast, no influence of the preparation on leucopoiesis was demonstrated, and only slight changes were observed in histopathological indices. This study is part of the long-term research project MSM 6215712402. Manuscript preparation was partly covered by the long-term research plan of Masaryk University (MSM 0021622412).